Over the last two years, CSHL has applied its excellence in basic research and innovative technology development to understanding the rare but intractable sarcoma cancers. The Lab has expanded its sarcoma research with hires of both young trainees and senior clinician scientists that promise to accelerate sarcoma research at the Lab. At the same time, CSHL has entered into a strategic clinical affiliation that offers greater access to patient samples, and more rapid therapeutic screening. 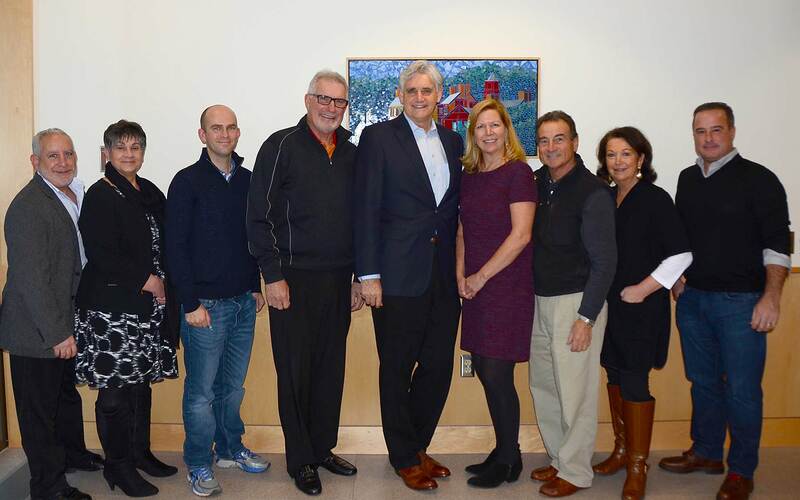 With the funds from the Sarcoma Research Project, CSHL is now poised to make tremendous strides in understanding these cancers and developing novel avenues for treatment. CSHL’s Assistant Professor Chris Vakoc is working to define the genetic dependencies and addictions in sarcomas. With a proven track record of uncovering druggable targets in cancer (his work helped spur clinical trials of a potential drug for leukemia patients), the Vakoc lab is working to pinpoint specific protein regions that are required for cancerous cells to proliferate. In their latest work, Chris and his lab have developed a cutting-edge, high performance screening technology that allows researchers to interrogate not just individual genes but functional units within a single protein. The technology relies on a new gene editing strategy, known as CRISPR, to discover vulnerabilities in cancers. Chris has assembled a team of dedicated researchers that are working together to use this new gene scanning method to screen thousands of genes in an effort to identify potential drug targets in rhabdomyosarcoma and other cancers. New hires, including a postdoctoral fellow and graduate students, have been expertly trained to use the cutting edge gene-editing technology with thousands of compounds to search for new genetic dependencies in sarcomas. The Sarcoma Research Project at CSHL has also benefited from a new partnership between the Lab and Northwell Health. As one of the largest health systems in the northeast, this strategic affiliation offers researchers at CSHL access to patient samples and clinical data that will accelerate the movement of basic cancer discoveries into the clinic. Now in its second year, the partnership has already funded 16 translational pilot projects at CSHL and a Phase 1 clinical trial for a new breast cancer treatment is ongoing. As part of this alliance, CSHL and Northwell Health have jointly recruited Dr. Robert Maki, MD to serve as Director of the Center for New Cancer Therapies at Northwell Health Cancer Institute. His primary role will be facilitating the translation of basic research into the clinic, but he will also hold an appointment at CSHL as full professor and member of the CSHL Cancer Center. In his own clinical research, Bob is a world leader in exploring the molecular weakness in sarcomas, focusing on the tumor microenvironment and genetics. He is also one of the nation’s leading clinicians in treating sarcomas.